Today we have some pictures of the present heat wave. This page has quite a few large pictures and takes almost two minutes to download but together with the text I think its worth your consideration. Greg Wesnoski, Tisdale Taxi - 873 9080. Find out about this new service. Here is the last month of the Century's calendar of events. An editorial by Timothy Shire dealing with societial concerns about criminality. Find out about the work of the Health Care Auxilary. Stu Innes shares with us his thoughts on proposed tax reform and he suggests some alternatives. Mario deSantis explains to us some facts about government spending that will shock you as millions and millions are used to purchase poorly functioning software. What's on your computer tonight? Today we take a look at the merging of media and one attempt at television on the Internet. A report on last night's Rambler win over Birch Hills. William Shakespeare's amazing comedy comes to life in Michael Hoffman's outstanding feature film, this is a "must see". A look at last night's sunset in a sequence of four pictures and a bonus. Time for a hay ride with the Roman Catholic Church. Good cheer and charming decorations abound as Christmas and commerce mix. Mario deSantis gives us some thoughtful comment on the recent conference on the World Trade. The Town of Tisdale is getting ready to tear down the former GT Mechanical building. I never tire of taking pictures of great sunsets and enjoyed last night's immensely so here is a collection of pictures of how Tuesday ended. A look at a mid sixties pickup truck. A bit of construction on the bridge on the South East of town. Community Senior Citizens project stakes their claim. Find out more about this project later this morning. Edwin Wallace gives us some insight into the major issue of 1999 as he considers the cries for support and the way that support might be given. Not a good year so far for tow trucks and service station jumper trucks. Sometimes things are what they are even though they were meant for another time of viewing. This pictures sparks some consideration of how we sometimes are like leafless trees and Christmas decorations in daylight. The rubble that was once the TUCs building is now being hauled away. Post date a cheque, used to work but not anymore. Mario tells us about his real life experience with the service charge kings of the marketplace. December is definitely the month for clouds and here are some angels. What appeared to a gray morning is suddenly a shattered sky as the sun flashed through the morning's broken cloud. We have some pictures of some houses at the Muskoday Reserve. Ramblers beat Kinistino 6 - 4 last night. From its ashes this company is struggling back into operation. A simple but extremely effect Christmas lawn display consisting of three whimsical Angels. Schapansky's auction Saturday brings out the toy hunters. HiHo, HiHo its off to work we go, this picture was taken at 8:45 as Monday got underway in Tisdale. Thanks for dropping by, would love to hear from you. With the cars lined up for loading the Louis Dreyfus terminal is moving this year's crop to market and needs a little touch up to improve its handling capabilities. Monday was the day for the trucks to haul away production from Northern Steel. Today marks a minor anniversary, this day a year ago Ensign began posting the weather each day and now by clicking on the weather log you can go back to a year ago today to see what it was like. Mario tells us about the things we can expect from our banks in the future. The town of Tisdale is preparing the site for the new Senior recreational centre that should begin construction in the spring. Minor cold snaps settles in with ultra clear skies and -27 degree temperatures. Check out the sundogs that decorate the morning sky. This picture shows mainstreet Tisdale at 9:35 with just a hint of sunlight edging though a difficult East wind sky. Cold morning for street side sales. A sequence of pictures that tell the story of this day's arrival. Today we take our first sparkle tour as we show you a few of the many beautifully decorated homes in Tisdale. This article includes a QuickTime VR of one spectacular yard. If you click on "Front Pages" you can go back to a year ago today and see the snow that fell then. Here is an on the spot complete game report on Friday night's game between the Ramblers and the Tigers. RCMP intercept everybody in holiday roadside checks. Mario gives us his take on the Minister of Health's comments about the huge over run on the closure of the Plains Hospital. Exciting to be able to bring you a flower story at this time of the year. So why is this and several other properties not for sale or development. A short account of last night's game. There is a certain comfort in knowing things are as they should be. We definitely have winter in Tisdale, see what things are like in today's winter article. The merger to produce the largest railway in North America is your loss. This morning Timothy Shire looks with regret upon this serious economic decision. Edwin Wallace gives us some important insight into yesterday's leading agricultural story calling for a vote on the operation of the Wheat Board. Apple computers has topped world sales for over a month now with its cleverly designed iBook. A look at the faces of Christmas shoppers and a longing for what is missing. A look at more Christmas lighting, this time all within a block of our house in Tisdale. Mario deSantis brings us a message of hope as he points the way to a simpler and much easier way of handling our personal growth as we plod through each of life's experiences. Last Minute Shoppers Mellow and There is "Good Will toward men!" Come along as Timothy Shire does his Christmas shopping and see what things were like. Using the sky and its gentle format a review of Christmas eve and some reflections. In the midst of the last day to get those precious presents we find a young woman doing demos in the Bay's toy department. 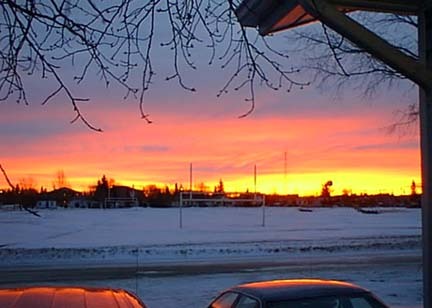 This is Christmas day as it began in Tisdale with the sky flooded with crimson. At 10:15 this is the way Tisdale's main street looks this morning. Though many businesses are open few have any customers. Of the various service stations in town the Co-op and ESSO are selling gas and only the Shell is doing service work. Today we have a simple sunset for you to pursue Twenty-four pictures taken near Watson last night put together into a QuickTime Vr that will let you look around from horizon to horizon. Is It The Seeing of Art, or The Art of Seeing? As people look back on this century and consider the important things people have achieved it might be good for us to consider what has happened in art. This article will be posted later this morning and drop back to look it over. Thanks for stopping by this morning. Luc Simoneau and the Tisdale Ramblers whack Kinistino Tigers with a 9 - 3 win last night. As this year ends and a new one begins we have a fresh covering of snow welcoming us this morning.